You don't have to hike far or high to get views of our state in full color. Check out 10 of our favorite foliage hikes. Soon leaf peepers will fill our roads as they flock to New Hampshire to witness the turning of the leaves, but we know a better way to experience this beautiful season than through window glass at 65 miles per hour. The cool, crisp air of autumn is ideal weather for hiking and the riot of color offered by the fall foliage is the perfect backdrop. Lace up your boots, get outside and find some of the best views in New England with one of our 10 hikes that promise big foliage payoffs. Plus, if hiking seems a little out of reach, we suggest five easy scenic walks anyone can enjoy. • Pack extra provisions. Make sure you have plenty of water, food and protein bars for energy and stamina on a hike. • Make sure you have proper precautions in case of injury. Pack bandages and always wear proper footwear to prevent blisters. • Temperatures can change rapidly in high elevations so make sure to pack sensible clothing and sunscreen. Always bring a jacket or sweatshirt in case the temperatures drop. • Cell phone reception is often spotty in the mountains so make sure you have backup plans. Pack a compass, trail map and always be sure to tell people where you are going. • Even if you're not planning to spend the night, be sure to pack a flashlight, lighter or matches in case you need to see in the dark. A waterproof container is the best for storing these items. For more fall fun, including Halloween events and haunted places in NH, be sure to visit our Guide to Fall in NH. It's all about the view, isn't it? And one of the most spectacular views in the Presidential Range is the prospect from Lookout Ledge, a rocky outcrop on the side of Mount Randolph that offers a breathtaking view of King Ravine, Mounts Adams and Madison and the peaks of the Carter Range. The Ledge Trail is the most direct route to the precipice. The 100-year-old trail is about 1.3 miles long with a rise of about 1,000 feet. It begins off Durand Road in Randolph near the former parking lot at Ravine House. The trail can be steep at times. It follows an abandoned driveway then climbs northwest for a half mile or so before turning right toward Randolph Mountain. It takes a sharp left and follows an overgrown lumber road that intersects with Pasture Path at 1.2 miles, just before arriving at the ledge. The hike to the ledge takes about an hour and a half. FYI: If you can work it into your schedule, grab a bite at Libby's Bistro in neighboring Gorham. It's a favorite of members of the Randolph Mountain Club for funky fine dining with a local accent and national reputation. Pictured above: Welch-Dickey Trail in Waterville Valley is an easy hike with a pretty payoff. Just as spectacular but less lofty than Cardigan is a loop of the summits of mounts Welch and Dickey, which is far less taxing and a great hike for the whole family. The peaks overlook the entrance to Waterville Valley and their rocky summits are visible from Rte. 9. The Welch-Dickey Loop Trail begins at the lot on Upper Mad River Road. The complete circuit is four and a half miles long with a vertical rise of 1,800 feet. It is best to follow the loop in a counterclockwise direction because the summit of Welch can be steep and is easier to climb than descend. About 45 minutes after leaving the trailhead you ascend to the top of a cliff below Mt. Welch with a stunning overlook of the boulder-strewn Mad River below. It's a great place for a picnic or even as an end point if the little ones have had enough. The trail then climbs up to the summit of Welch Mountain with a great view of the rocky knob of Mount Dickey beyond. The trail descends through a col before lumbering up to the summit of Dickey. The summit is backed by a stretch of ledges with great views of Mount Tripyramid and the other peaks that overlook Waterville Valley as well as the peaks of Franconia Ridge. The ledges are covered with blueberry bushes that attract bears in the warmer weather and there is a stand of jack pines, one of only four in the state. The trail then descends over a rock dome that can be slippery when wet, then back under the trees and return to the parking lot. FYI: Knowledgeable hikers stop at the Main Street Station, a diner in an authentic dining car, just off Rte. 93, for a quick meal when driving back from the trail. Mount Monadnock is one of the most climbed mountains in the world. It's also one of the most storied. The peak where Thoreau, Emerson and many other 19th-century transcendentalists communed with a higher power attracts a large crowd during peak foliage. During the Columbus Day weekend the summit can become congested with so many hikers that it can look like the audience at a rock concert. But the tug of the Monadnock is irresistible for those of a literary bent. So we suggest you take the path less traveled, and rather than take the crowded trails that leave from the state park headquarters, hike up the other side of the mountain on the Birchtoft Trail. It begins at the Gilson Pond area on Dublin Road near the eastern base of the mountain. The trail is marked with red rectangles. It skirts the pond before heading uphill. Over the next 1.9 miles the trail rises 900 feet to the junction of Cascade Trail, whichcontinues up to the summit of Monadnock. But we suggest marching only 40 yards up Cascade before turning right onto the Red Spot Trail and proceeding up a mile and another 850 feet in height to the intersection of the Pumpelly Trail. There, you can find yourself a seat on a rock outcropping where you can enjoy a picnic lunch overlooking the Boston skyline on a clear day, as well as the crowd of the less enlightened fighting for rock space at the summit of the mountain. The hike should take you about two hours and 40 minutes to the top and maybe a short hour and a half back. Don't bring Fido. Dogs are not allowed in the state park. FYI: We suggest you stop at Nature's Green Grocer on Union Street in Peterborough, just a mile or so off Rte. 101, to pick up an amazing sandwich or fresh fruit smoothie for your picnic. The Lakes Region may not be the first place that comes to mind when planning a hike to peek at the peak foliage but Mount Major offers more bang for the sightseeing buck than almost any other short hike we can think of. It is a small hill with a big-time view overlooking the state's largest lake. The trailhead is on the west side of Rte. 11 in Alton Bay. It's about 3.4 miles out and back with a rise of 1,159 feet to the 1,784-foot summit of the hill. It just takes about two to three hours, depending on your pace. This is a popular hike for summer campers and you can be overwhelmed by little ones during the warmer weather, but it's much less crowded in the fall. It's a dog-friendly hike to the rock dome with a gorgeous view of the hills around Mount Belknap reflected in the waters of Alton Bay and Lake Winnipesaukee. Fire towers aren't built for comfort; they're built for only one thing — the view. As one might expect the fire tower at Pawtuckaway State Park offers a great view of the 5,000 acres of conservation land. Its vantage point atop the 885-foot South Mountain may not be stratospheric, but it is more than adequate. Though the summit is wooded. there are plenty of areas to scramble and climb to enjoy great views of the region. 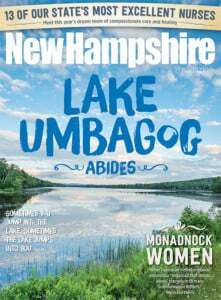 Climb the four stories up the fire tower to ogle the Uncanoonucs, Mount Monadnock, the Seacoast and other summits in the region. Mountain Trail is a 2.4-mile hike from the parking area on Mountain Road in Pawtuckaway State Park in Nottingham. It takes about three or four hours for a leisurely hike. Leave Rex at home; dogs are not permitted in the park. Pictured above: View of Canaan from the top of Cardigan Mountan. Photo by Bob Misuraca. The rocky summit of Mount Cardigan offers a lengthy ridge walk with a panoramic view of uncountable rolling hills with Mounts Monadnock and Sunapee and the White Mountains in the distance. Though the summit is only 3,155 feet above sea level, an 1855 fire burned all the trees and brush on the summit so it offers unobstructed views in all directions. There is a fire tower on the peak but climbing it doesn't improve the view much. The most direct route is the Holt Trail from Cardigan Lodge to the summit. It is 2.2 miles to the summit and takes about two hours. The 1,750-foot rise is steep at times and may be too much for children. For a kinder, gentler hike that also begins at Cardigan Lodge take the Manning Trail to Mowglis Trail. The trip is about 3.1 miles long and takes roughly two and a half hours at a gentle speed. Much of it is above tree line. This route passes over the north summit of Cardigan, which is called Firescrew because of the smoke that corkscrewed from its summit during the 19th-century fire. You can either return down Mowglis to Manning or take the more direct route back to the lodge on the Holt Trail. FYI: Cardigan Lodge is operated by the Appalachian Mountain Club and offers rooms and meals. And while you're in the area, Sculptured Rocks State Park on Rte. 3A in Groton makes a nice side trip. It's a gorge where a glacial river scoured a swooping path leaving behind several swimming holes during the retreat of the glacier 12,000 years ago. If you're hungry, grab lunch at the nearby Hebron General Store, a vintage establishment with a contemporary sandwich menu. Pictured above: Temple Mountain Ledges. Photos by Susan Laughlin. The Temple Mountain ledges offer a great ridge walk with majestic views of neighboring Mount Monadnock and an almost surreal environment of rock ledges decorated with 10-foot-tall rock cairns and chairs constructed from rocks and boulders. The ledges are on the Wapack Trail. The section we'll describe is about three and a half miles in length and will take a leisurely three or four hours if you include the return trip. Leave your car at the car park at the Wapack Trail sign on Temple Road about .6 miles southeast of Rte. 123 in Temple. A rocky footpath rises from the lot and eventually follows a stone wall up to the Sharon Ledges overlooking the surrounding forest and Lilliputian homes below before ascending to a summit with panoramic views of mounts Watatic and Monadnock. The trail then follows a stand of trees with views overlooking Spofford Gap. It ascends Holt Peak and proceeds to the Temple Mountain Ledges where rock cairns create an otherworldly landscape. The cairns mark the trail but have no other real use other than to provide a creative outlet for generations of hikers. If you have two cars or a friend willing to pick you up, you can continue along the trail over Temple Mountain past the former ski area to the parking lot on Rte. 101. FYI: Gary's Harvest Restaurant on Rte. 101 in West Wilton is near the base of Temple Mountain and is a casual, family-friendly restaurant that makes a great pit stop with killer homemade pies, bread pudding and pancakes served with real maple syrup. For the Anglophile hiker, a trip to Temple and the Birchwood Inn's London Tavern for a pint of bitter and a plate of bangers might just be the perfect post-hike repast. Pictured above: The Cy and Bobby Sweet Trail covers an area that Aristotle Onassis once wanted to use for oil storage. Photo by Susan Laughlin. The Cy and Bobbie Sweet Trail is a particularly flat path that meanders four miles from Longmarsh Road in Durham to the Great Bay Estuary in Newmarket. Built by the Great Bay Resources Protection Partnership, it opened in 2010 and is named for two long-time conservationists from New Castle. It begins at a boardwalk that leads to a great view of a beaver dam before meandering its way through the 2,500-acre Crommet Creek watershed. The trail provides a ground-level tour of the freshwater estuary as it wends its way to an overlook of Great Bay. Along the way there are several viewing platforms overlooking the marshes and woodlands, beaver ponds and even a great blue heron rookery. There is additional access to the trails from Dame Road in Durham and Lubberland Creek Preserve in Newmarket. For a map of the trail and other information visit nature.org. Mount Moosilauke towers 4,802 feet above the upper Connecticut River Valley and is the westernmost 4,000 footer in the White Mountains. It is also one of the most spacious summits with more than 100 acres above tree line with panoramic views of the state. It's also dog friendly, though the Dartmouth Outing Club that maintains the trails asks that your pet be leashed when climbing above the tree line. The first European to attain the summit in 1773 was a moose hunter, but the mountain isn't named after the mighty ungulate. The name is a contraction of the Abenaki words "moosi" and "auke," which means "bald place." The peak was once the site of Tip-Top House, lodging for the 19th-century swells who flocked up to the summit on carriages. We recommend a loop that ascends the Gorge Brook Trail and descends down via the Carriage Road to the Snapper Trail. Gorge Trail begins at the Dartmouth Outing Club's Moosilauke Ravine Lodge on Ravine Lodge Road in Warren. The trail follows a logging road down to the Baker River and crosses a footbridge. The trail then rises a little more than a half a mile before crossing another bridge over Gorge Brook just before the intersection of the Snapper Trail. It passes a small clearing looking south at about 2.6 miles before surging up to the bald summit of Moosilauke at 3.7 miles. After dawdling to enjoy the view, and maybe even a picnic lunch, take a left onto the Carriage Road Trail that once accommodated buggies and go left again onto the Snapper Trail, a former ski trail named for Ed "Snapper" Harris who worked on the trails at Moosilauke for many years. The trail has been relocated to provide a less-steep descent. It rejoins the Gorge Brook Trail near the bridge over the Baker River. The 7.6-mile loop should take about seven and a half hours. You don't need a weatherman to tell which way the wind blows, and you don't need to attain a lot of altitude to see the trees turn. Somewhat off the beaten path in Rumney, Three Ponds Trail is a short hike that is constantly changing due to the relentless activity of generations of beavers whose dams appear and disappear depending on weather conditions and the effectiveness of their engineering. In addition to several beaver ponds you may see the fields left behind where a dam has failed, leaving behind a treeless pasture very attractive to moose and deer. In a year or two, brush and trees swallow up the pasture until more beavers arrive to build another dam. Three Ponds Trail begins at a parking lot on Stinson Lake Road, 6.9 miles north of Rte. 25. It marches gently up, crossing back and forth across a stream and crosses through prime moose habitat before arriving at a shelter overlooking a large lake and beaver lodge. The walk to the shelter is about 2.3 miles and takes about an hour and 20 minutes. The shelter is a great place for lunch or even to cook a hot dog and s'mores on the fireplace. About three tenths of a mile after the shelter trail meets Donkey Pond Cutoff, bear left and stay on Three Ponds Trail, and after 200 yards or so you will arrive at a small tent site with a rock fireplace. Just beyond the site is a picnic-table-sized rock overlooking another pond. The boulder makes a great picnic spot. You can drape your legs over the side, grab a sandwich and keep your eyes on the far side of the lake where moose often wade to nosh on the underwater vegetation. Pictured above: Ponemah Bog. Photo by Susan Laughlin. Leap peeping is not an extreme sport. There are many trails that don't require athletic prowess to enjoy a scenic walk in the autumn woods. Walk 1: The Hyla Brook Trail at the Robert Frost Farm in Derry is one of the shortest hikes in the state and one of the most culturally significant. The half-mile walk through meadow and forest behind the Frost Farm on Rte. 28 provided inspiration for the author of "Mending Wall" and "West Running Brook" and other poems celebrating country life. Walk 2: Ponemah Bog, off Rhodora Drive in Amherst, owned and maintained by the Audubon Society, offers another form of earthly inspiration. It's an easy walk, a little shorter than a mile, mostly on a boardwalk with several observation platforms overlooking an acidic kettle hole bog with a cranberry moss carpet left by the retreat of the last glacier. Walk 3: Beaver Brook Association off Ridge Road in Hollis offers 35 miles of easy trails through forest and wetlands, beginning at a big old barn, with showcase gardens and nary a hill. Walk 4: The Urban Forestry Center, off Elwyn Road in Portsmouth, has a self-guided nature trail through a mixed deciduous forest, pine plantations and a salt marsh wetland. The two-mile (round-trip) Goodwin Trail visits the wetlands at Sagamore Creek. Walk 5: And what could be more appropriate than a walk in the woods at Weeks State Park, the former Lancaster estate of Massachusetts Senator John Wingate Weeks, author of the 1911 bill that created the White Mountains National Forest. An easy hiking trail off Rte. 3 rounds the base of Prospect Mountain for about three miles and takes about three hours. A 56-foot-tall fieldstone tower, originally built as a water tower atop the hill, provides a panoramic view of the Presidential mountain range, the Upper Connecticut River Valley, the Kilkenney range and the Green Mountains in Vermont. The tower is open weekends through October 8. In the summer of 2011, Crotched Mountain opened over four miles of fully accessible mountain trails. This is the longest mountain trail network of its kind in the U.S., offering everyone – regardless of physical ability – the chance to explore this beautiful area. For those with disabilities or anyone who has trouble getting around, the four miles of gently sloping mountain trails are able to accommodate wheelchairs, powerchairs and other means of assistance. Click here to see a 10-minute video about the trails and what it means to the people who can now enjoy a day in the great outdoors all the way from a meadow, to the top of a mountain and down into a wetland.